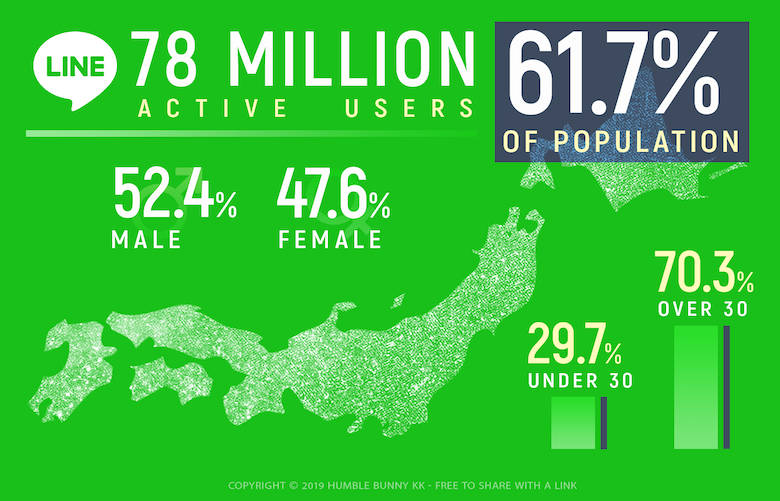 Welcome to our fourth annual report on Japanese social media, where you can find the latest statistics and insights for Japan’s social networks in the coming year. This article will list up the most popular social networks in Japan, give insights on how each platform is different, and deliver our take on where things are headed in 2019. All of our insights are based on our tracking of the past four years of data. Please check out our reports from 2016, 2017, and 2018 to see how social media has changed in Japan over the past few years. *This blog was updated on February 25, 2019 with MAU data for TikTok. Compared to last year, Twitter is still on top but Instagram seems to have overpassed its owner, Facebook. Unfortunately, Facebook hasn’t released any official numbers for Japan in 2018, so we don’t know this for sure. Let’s take a deeper look into each network and see what you need to know when connecting with Japanese people on social media. Twitter is and has been the dominant social network in Japan for a long time. Japan is Twitter’s second largest market globally, behind the USA, and second in total penetration, behind Saudi Arabia. If you’re talking to a Japanese person, there’s a 1 in 3 chance that they’re an active Twitter user. That’s a huge potential for brands to connect with the greater Japanese population! Nearly three-quarters of all Japanese students and half of young professionals use Twitter weekly. There’s no place that is more active online among young people than Twitter. This is important, since the demographics on age and gender might give you a different picture. Young Japanese people are on Twitter weekly, and are talking about everything there. Interestingly, weekly usage tends to drop as Japanese people become older. Still, Twitter is a must for brands that are targeting high school and college students in Japan. Nearly three-quarters of all Japanese students and half of young professionals use Twitter weekly. Most of the top 100 Twitter accounts in Japan belong to individuals and celebrities. While we did find some company accounts in the top 100, they are not as prevalent as they are on Facebook and Instagram. Aside from this, there are also many news and information based accounts in the top 100. It seems like many Japanese people are using Twitter to get news updates and to keep up on their favorite celebrities in Japan. Twitter is the ubiquitous social network in Japan. It can be used to reach a wide and diverse audience. Since younger users are the most active, any brands that are targeting generation Z and young millennials should be on Twitter. Additionally, Twitter is easily integrated into other forms of traditional media, such as radio and TV. We see Japanese brands doing this often to get coverage on multiple screens and canvases. If you’re planning a cross-platform marketing campaign in Japan, Twitter would be a great supplement to your existing promotions. Growth has been small but steady for the past three years, but we speculate that the social network has still continued to grow and might be closer to 30 million MAU in 2018. That’s basically on par with Instagram, it’s own social media success story in Japan. Unfortunately we haven’t been able to find updated data for active users in Japan from Facebook for 2018. Therefore we must rely on their last released MAU numbers from 2017. 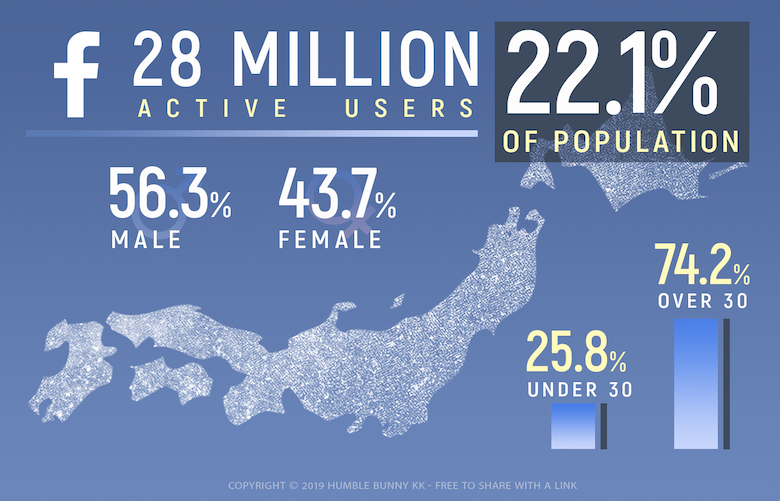 Survey data on demographics tell us that Facbook in Japan is mostly older and male, with a noticeable drop in use by young women in their teens and twenties. Despite this, 30 million users is nothing to dismiss, and Facebook as a medium can be very valuable to the right brands in 2019. Survey data tells us that Facebook is not very popular among high school students. Only 10% of this cohort report using the network weekly. Interestingly, this number is double among college students, 20%, and almost quadrupled among young professionals, 37%. As mentioned in previous blogs, Japanese people tend to see Facebook as a more professional network compared to Twitter and Instagram. This could be a factor as to why Facebook has become the mature social network of Japan. Japanese people seem to use Facebook more as they get older. Content for adults seems to do very well on Facebook pages, no surprise there. Facebook’s top pages in Japan are more diverse than other networks, and you can see the influence of older users in the brands that do well. Some of the biggest brands include alcoholic beverages, job listing websites, airlines, and shopping malls. That’s a lot more mature than the fashion and cosmetics brands that dominate Instagram, or the models and celebrities that dominate Twitter. If your brand is targeting middle aged adults, or professionals in their mid to late 20’s, there’s a good chance you could find them on Facebook. It also has some of the best ad targeting available in social media. Facebook would be a great place to promote high-end products, family-related goods, and even B2B products. Instagram is the fastest growing social network in Japan. In 2018 they added 9 million new users! We speculate that its similarities with Twitter are what helped Instagram become a household name in Japan. Japanese people tend to prefer mobile-friendly networks and appreciate anonymity online. Instagram delivers both of these on an addictive and fun platform that’s continuing to grow in Japan. Survey data tell us that Instagram’s user base is mostly young and female. Nearly a quarter of its users are women under the age of 30. Surprisingly, older men are a growing demographic on Instagram, and we expect them to take a larger portion of the user base in 2019. Similar to Twitter, Instagram’s most active users are from younger demographics. Usage is roughly the same between high school students, college students, and young professionals in their twenties. This suggests that Instagram has the interests of young and older audiences all at the same time. It will be fascinating to see how and if this changes over time, as more older users begin to adopt social media in the future. Nearly half of all Japanese students and young professionals use Instagram weekly. More and more men keep joining Instagram, surprisingly of an older demographic. It seems like a lot of their attention is focused on automotive and entertainment. Two great industries to share visual stories on via Instagram. Fashion is undisputedly the most popular content type among Japanese instagrammers. 40 of the top 100 brands on Instagram in Japan are related to fashion. Most of these are female oriented but there was a good mix of male oriented fashion as well. With the introduction of Instagram marketplaces and other e-commerce based upgrades, we expect to see this trend continue with more brands selling their wares via Instagram in Japan this year. Another interesting trend was food. One of Japan’s most popular Instagram accounts belongs to Buzzfeed’s Tasty brand. On this account they show quick recipe videos with links to the whole method on their site. It’s apparent that Japanese Instagrammers are also looking for good food tips to go along with their trendy outfits on Instagram. It is important to remember that Instagram is highly visual. If you’re going to start to push your brand there, then you must be good a visual storytelling. Fashion, food, entertainment, and automotive brands do very well on the platform because their products are very visual by nature. Consider your brand, your product, and your customers when planning an Instagram campaign. Be sure that it can appeal to the young, visual style that Instagrammers in Japan have come to expect. Although LINE is more of a messenger app than a social network, we feel it must be mentioned in any blogs related to social media in Japan. As you can see in the numbers above, Line is nearly ubiquitous in Japan and is surprisingly still growing strong. The most important thing to know about LINE is that it is a messenger app first, and a social network second. Most LINE app activity is strictly in private and group chat rooms, not on the timeline function. There is a spark of life for social activity on LINE though. Survey data indicates that about ⅓ of teenagers in Japan use LINE timeline regularly. This is promising for LINE and may indicate that their social functions could increase in the coming years. We’ll have to wait and see what happens. We’ve got a lot more information about how to advertise on LINE in some of our other blog posts. Please check those out or get in touch with us to find out more. TikTok now has 9.5 million monthly active users in Japan. Making it the newest major social network in Japan. TikTok is a relatively new platform, which started out in China, and has become a rising success in Japan. It currently gets over 30% of its downloads from Japan, coming mostly from teenagers and younger audiences. The company also reported that 65% of their iOS users are female, which fits the trend of Instagram and Twitter’s demographics. The platform mimics Vine, where users can post and share short videos publicly. A lot of it’s more popular content seems to be related to music and dance. They also have an innovative promotional channel involving challenges. This involves users filming themselves singing & dancing to a song and submitting it under a specified hashtag. These sort of challenges boost brand awareness and allow consumers to get creative with the brand. If you’re trying to break into the freshest platforms, and connect with Japanese youth, then TikTok could be a great opportunity. Also, since it’s new, there may be less competition than the bigger social networks. Why do People Use Social Media in Japan? Most people seem to be using social media to gain helpful information about something. This might indicate that Japanese people are using their social networks as a supplement to regular search queries on Google or Yahoo. Another interesting point is that Japanese people are turning to their social networks to find new hobbies and places to go. This is a testament to the importance of starting and becoming a part of your customers’ conversations on social media. It’s already known that Japanese people have high skepticism towards institutions and companies. Social media is a great tool to overcome that skepticism through direct conversation and social proof reviews of your brand. All of this information above should be considered when you are planning your next moves for social media in 2019. If you have any questions about the blog or would like some advice about how to use this data to get your brand going, please get in touch. We’d be glad to go through it with you and help you connect with your Japanese customers in 2019.